In this article I describe why and how I created the world's fastest Promise implementation. This ability opens up a world of compositional possibilities. Take special care in understanding this – it is the entire operation, including the arguments passed and the state of the operation that is encompassed in this object. In fact promises are included in most current browsers already and you could nearly go ahead and use them directly right now, if it weren't for one particular browser. Guess which browser that is. It turns out that currently only about 63% of browser traffic can take advantage of Promises. So we need a shim. Well, that surely won't be a problem – we have an accepted standard, so plenty of people have written compliant libraries we can use. In fact, jQuery has one built in! No problem right? Well, it turns out that jQuery uses a different API than the spec defines and is significantly less useful. Luckily there is a good list of conformant implementations. So, just include one of these puppies in your builds and you're golden, right? Well, thats true. But for resource and performance conscious developers (thats you, right?) the excitement quickly turns to horror as you see the byte weight of these things. The Bluebird Promise implementation, which is considered the fastest and most comprehensive solution available, is a whopping 72,436 bytes after minification. There are smaller options available, but their performance is abysmal. In fact, in the early days of promises, all the available implementations were pretty slow, leading many to believe that promises, by their nature, were far too slow to replace callbacks in performance-sensitive code. So now we know that promises can be small, and promise shims can be performant, but what about small and performant? Well, I had no luck finding any implementations that satisfied that tiny wish list. So I wrote my own implementation that did. 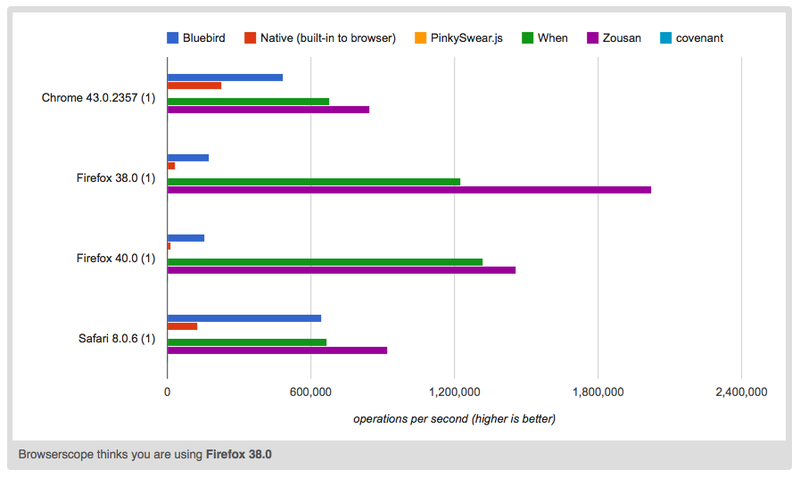 Interestingly, it is much faster than the native Promise implementation (red bar) in modern browsers. So it is likely that even once ECMAScript2015 (ES6) fully rolls out to browsers, you will still benefit from using Zousan instead. How Can Zousan Be So Darned Fast? Zousan takes advantage of the super fast asynchronous mechanism I call soon() and blogged about here a couple months ago. In fact, while writing Zousan I found a way to squeeze a bit more performance from the soon() module - so look for a part 2 to the soon() article if you want the details. This is especially true for small arrays, since the cost of creating that anonymous function becomes proportionally large. That's right. The constructor does nearly nothing - particularly if you pass nothing. All state variables and listener trackers are created on an as-necessary basis. Lazy, eh? But oh so fast. And in cases where a promise is created and resolved before any then() calls hook into it, no trackers are created ever. These techniques collectively make for an extremely efficient implementation – both in terms of speed and memory usage. One that handily beats the built-in Promises of modern browsers as well as any other implementation I've tested. How Can Zousan Be So Small? Actually, there are many promise implementations smaller than Zousan. PinkySwear, for example, is just 842 bytes minified. But this is achieved by making no efforts in performance at all, resulting in painfully slow code. (Its performance bar is so small in the chart above, it all but disappears). But among the faster solutions, Zousan is much smaller in size than others. Part of this may be due to my efforts to keep it small. Other libraries do not appear to have that criteria in their objectives at all. But the biggest contributor to libraries like Bluebird being so large is that they pack in a bunch of additional functionality. With Zousan I decided to provide a spec compliant module with minimal extras (I did include an all utility function as it is nearly essential). The other promise-based patterns are generally easy enough to write for those projects that need them. And eventually I'll likely create an extra module that can be included (or copy-pasted from) to make it even easier. Include Zousan in all your web applications and start migrating to promises right away. Its so tiny, there is virtually no cost to include it in your apps, and you can begin taking advantage of the power of promises immediately. Write any new asynchronous functions to return promises and as time permits, convert any existing callback-based code into promise-based code. A word of warning: many developers (possibly most?) find it difficult to wrap their heads around promises at first. Promises invert the responsibility (or at least appear to invert it) within asynchronous calls and this can take some time to get used to. You may be tempted to return to the apparent "safety" of callbacks - something you felt you understood and had more control over. But try to resist that temptation and stick with promises until you have your "ah hah!" moment. You will be happy you did. I prom… er, I assure you. A Promising Start - Embracing Speed and Elegance with Zousan Promises Tweet This!